Run the program and select ‘SSH-2 RSA’ and a key length of 2048, this will comply with NFS’s key requirements then click Generate. You’ll need to move your mouse around the screen for a little bit to generate entropy to seed the key. You can add a comment to help ID your key later and not get it mixed up with any others you use. While we’re in this window you should use the save buttons to save your public and private keys locally on your computer. The private key you saved will be used later in your SSH program. Next copy your public key from the key generator window – just select it and Ctrl-C.
Now in NFS, open your Account Profile and click ‘Add SSH Key’ on the right. Then paste in the key you copied in the box which appears on the next screen. That is NFS all set up. 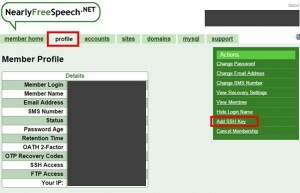 Here, we will enter our server’s username – for NFS this is usually your account name and your site name – this will be in the site details tab of the NFS config screens. In the Auth submenu there is a field to browse to the private key file so point putty to your saved file from earlier. Go back to the ‘Session’ screen and give your session a name then hit save. Now every time you connect through the saved session in putty, you’ll not be prompted for your username and password.